With the New York Giants now sitting at 3-8, any chance at an (unrealistic) dream run ended last Sunday. The Giants blew their opportunity at sneaking into the playoffs by choking away a 19-3 lead. With ill-timed turnovers, bad defense, penalties (or lack thereof), and curious decisions all around the Giants lost with the blame pointed at Shurmur. Pat Shurmur now owns a 13-31 record as an NFL coach. 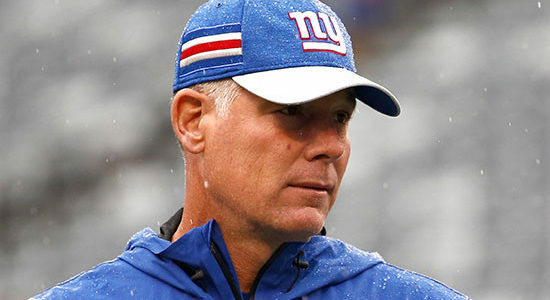 The record reflects a poorly constructed team; however, Shurmur nothing to improve his odds of winning: questionable play-calling, terrible in-game adjustments, and poor clock management. With even a decent game out of Shurmur against the Eagles, the Giants win. Instead, Shurmur went down in flames. What little patience the Giant fan base has left is wearing thin with Coach Shurmur. There has been little to no consistency. Shurmur has failed to capture the fans hearts and with the Chicago Bears coming into town this weekend, I am not sure it will get any better. In the first half against the Eagles, the Giants started strong with a 9 play, 75-yard first drive. There was a perfect blend of run and pass, culminating with a beautiful screenplay to Saquon Barkley for a 13-yard score. The Giants followed that first drive with three subsequent scoring opportunities to take a 19-3 lead. Yes, Eli Manning threw a horrific pass into triple coverage to Odell Beckham Jr. to end the half. Manning, as 15 year NFL veteran needs to know a good pass from bad regardless what his HC wants. After the game, Shurmur claimed the “interception” was his fault for essentially calling for an end zone shot when a field goal would have sufficed. That coupled with the decision to go for two points on the Giants first touchdown drive cost the team four points (field goal + extra point). There is a time and a place to be aggressive, and more often than not, Shurmur’s decisions have backfired. The Giants Head Coach also gave a lesson on terrible time management. Backed up against their own end zone on a 3rd and 18 the Giants burn a timeout only to throw a swing pass to Gallman for a 2 yd loss. On the final drive, the Giants were left with no time because of these errors. He also decided not to involve Beckham and Sterling Shepard against a massively undermanned Eagles secondary. Philadelphia was literally playing with players that were not NFL starters two weeks ago. In the end, the Giants were massively out-coached in the 2nd half. Shurmur made ZERO half-time adjustments and really showed his lack of insight, lack of creativity and lack of focus for what is needed to win in the NFL. His seat is already starting to warm up and he is barely through his first season. For this week, Pat Shurmur gets the “Dud of the Week” award.